Manned Mars Plan: Phobos by 2033, Martian Surface by 2039? Humanity's path to Mars may go through Phobos, one of the Red Planet's two tiny moons. 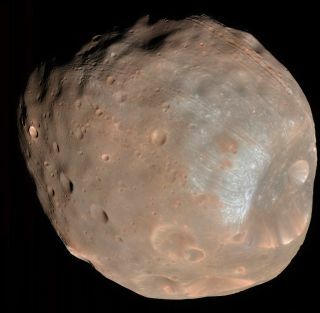 Humanity's path to Mars may go through the Red Planet's tiny moon Phobos. An incremental, multiple-mission approach that envisions getting astronauts to Phobos by 2033, then down to the Martian surface by 2039 could make manned Mars exploration technologically and economically feasible, said Firouz Naderi, head of the Solar System Exploration Directorate at NASA's Jet Propulsion Laboratory in Pasadena, California. "Is anybody really going to be excited if we're going to Mars in 2070 [or] worse yet, sometime in the future but we don't know when?" Naderi asked delegates Wednesday (May 6) during the Humans to Mars Summit in Washington, which was hosted by the nonprofit organization Explore Mars, Inc.
Several space tugs, powered by solar-electric propulsion, would be placed in Mars orbit with supplies that future crews could use for landings. The mission to Phobos — one of the Red Planet's two miniscule moons; Deimos is the other — would require four SLS launches, while a six-day stay on Mars on top of that would bring the total to six liftoffs. Keeping the cost of manned Mars exploration down will also require in-situ resource utilization — living off the Martian land as much as possible, said Oliver de Weck, an aeronautics and astronautics professor at the Massachusetts Institute of Technology, in a separate panel. A study performed by de Weck and his graduate students suggests that using Mars' water, methane and hydrogen could cut the initial mass sent to low-Earth orbit for a Mars mission by 48 percent. Further, de Weck suggested money could be saved by treating Mars exploration as a network of missions with linked objectives, rather than a series of one-offs. Common elements among various missions will also save on cost, since the same technology can be recycled, added Brand Griffin, a senior aerospace engineer at NASA's Marshall Space Flight Center. "Commonality: it has to lead and it can't follow. It has to be at the front end of the program," Griffin said. The Humans to Mars Summit ran from Tuesday (May 5) through Thursday (May 7).